Visiting Tybee Island, Georgia with Kids? While it is popular for families to head to the beach when school ends, Tybee Island is open year-round. Located 18 miles east of Savannah, this barrier island features wide sandy beaches, kid-friendly attractions and family-oriented events throughout the year. Tybee Island is a place where children can enjoy a variety of activities, and families can spend quality time together. Keep reading for an insight into just some of the things that you can see and do during a kid-friendly vacation on Tybee Island. The island is accessible by Highway 80 East from Savannah. While the island experiences cool winters, the temperatures start to rise in April and stay warm through September and into October. Although August is the wettest month, Tybee Island boasts more than 2,750 hours of annual sunshine. Be sure to pack sunscreen, sunglasses and other warm weather gear. The Tybee Island Visitor Center offers a free guide and travel planner that includes information about attractions, lodging, shopping and restaurants. The guide also includes beach rules and ways that you can protect endangered sea turtles during their nesting season. These include not touching turtle eggs, avoiding nest sites and refraining from shining lights on the beach at night, which frightens and disorients the turtles. You should also swim, surf and snorkel only in designated areas. While dogs are not allowed on the beach, they are welcome at many other attractions and activities. Our favorite option for combining upscale beachfront accommodations and family-friendly amenities. Close to shopping and fun things to do for everyone. Winner of South Magazine’s 2016 Best Place To Stay and Discover Tybee’s 2015 Best Place To Stay. We also recommend the DeSoto Beach Hotel and the Beachside Colony Resort for additional kid-friendly accommodations. In addition to beach access, these hotels have on-site pools, game rooms and Wi-Fi. Some are also pet friendly. Tybee Island is ideal for children who love being outside. Facing due east, the beaches feature warm breezes and gentle waves. Swim, build sand castles and search for seashells along the miles of white, sandy beaches. You can also enjoy a variety of water sports, such as kayaking, riding personal watercraft, paddle-boarding and surfing. Hang with the locals on Mid Beach or join in the excitement at South Beach. Along with seagoing vessels entering and leaving the Port of Savannah, North Beach is a good place to observe dolphins. Popular with families, Savannah River Beach also affords the opportunity to watch dolphins frolicking in the waves. Fort Pulaski National Monument was built in 1829. The construction of the bastion, named in honor of the Revolutionary War hero Casimir Pulaski, was partially overseen by then-Lieutenant Robert E. Lee. Children will enjoy running along the ramparts and exploring the casements. There are also period reenactments, cannon firings and demonstrations of life inside the fort, which is open daily from 9 a.m. until 5 p.m. Although there is a small entrance fee, the attraction offers free admission on various days throughout the year. Junior nature explorers will enjoy a trip to nearby Little Tybee Island. This uninhabited barrier island is comprised of hardwood hammocks, salt marshes and pristine beaches. It is an ideal location for nature hikes and bird watching. In addition to being home to bald eagles and numerous shorebirds, the island is a stop along the migratory routes for several other species during the fall, winter and spring. There are two large parks with sports fields, jogging trails, playground equipment and spaces for a picnic or barbecue. Families can play basketball and tennis or just let little ones slide, climb and swing before enjoying an outdoor meal. If the weather fails to cooperate, you can always take the fun indoors. The Tybee Island Marine Science Center is dedicated to preserving the natural resources of coastal Georgia. The interactive museum offers children the opportunity to learn about a wide variety of marine life and the local ecosystem. Along with fun beach walks, exciting exhibits feature jellyfish, sharks, crabs and sea turtles. The center is open daily from 9:30 a.m. until 5 p.m. Originally built in 1736, Tybee Island Lighthouse is the oldest and tallest navigation aid of its type in Georgia. The light has guided mariners safely into the Savannah River for more than three centuries. Now a museum, the five-acre site is one of the most complete lighthouse complexes in the country. Climb the 178 steps to the lamp house to see the operational first order Fresnel lens. On a clear day, the catwalk offers a spectacular view of the surrounding area. The renovated keeper’s quarters and Tybee Museum chronicle the history of the lighthouse and the island. There is a small admission fee as well as available discounts for students, seniors and active military. If it is raining or you are just looking for a place to cool off for a few hours, the Post Theatre shows a variety of family-friendly films throughout the week during the summer. Tybee Island hosts a number of annual fun-filled festivals featuring food, music and kid-friendly games and activities. The Beach Bum Parade takes place the weekend before Memorial Day. It is the unofficial kickoff of summer. As the floats pass along Butler Avenue, riders and onlookers squirt each other with water pistols creating the South’s largest water fight. The island celebrates the nation’s birthday with a festival and fireworks display July 4, one of the island’s busiest days. Held in October before Columbus Day, Tybee Island celebrates its buccaneer past with Pirate Fest that includes a parade, food, live music and street performers to end the summer season. The Tybee Island Pavilion hosts a variety of outdoor concerts throughout the year. There is also a variety of activities on the island during the holiday season. When staying on Tybee Island, take a day to explore the Hostess City of the South. A historic seaport and birthplace of Georgia, Savannah is home to numerous well-known attractions, such as the Owens-Thomas House, the Telfair Academy and Forsyth Park. 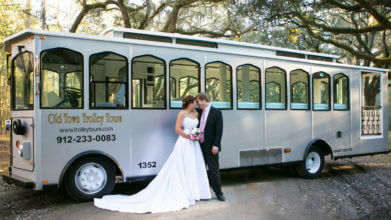 The city is also the birthplace of Juliette Gordon Low, the founder of the Girl Scouts and the setting for locations made famous by the bestselling novel “Midnight in the Garden of Good and Evil.” You can visit and learn little-known tidbits about these and many other attractions when you take the Old Town Trolley sightseeing tour of Savannah. From sandy beaches and water sports to parades and fireworks, activities abound on this unspoiled stretch of Georgia coastline that will keep children happy and occupied during your vacation on Tybee Island.